Lamar Valley's Soda Butte, May 8, 2018. 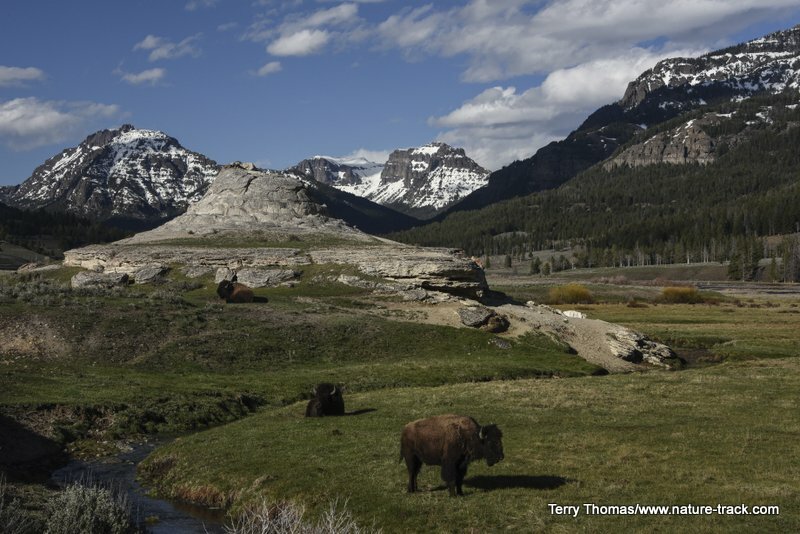 Millions of people are anxiously awaiting their visit to Yellowstone National Park this year. Some people though, are already experiencing the Park in a unique time of year: spring. The Park is quite different in the shoulder season before Memorial Day. 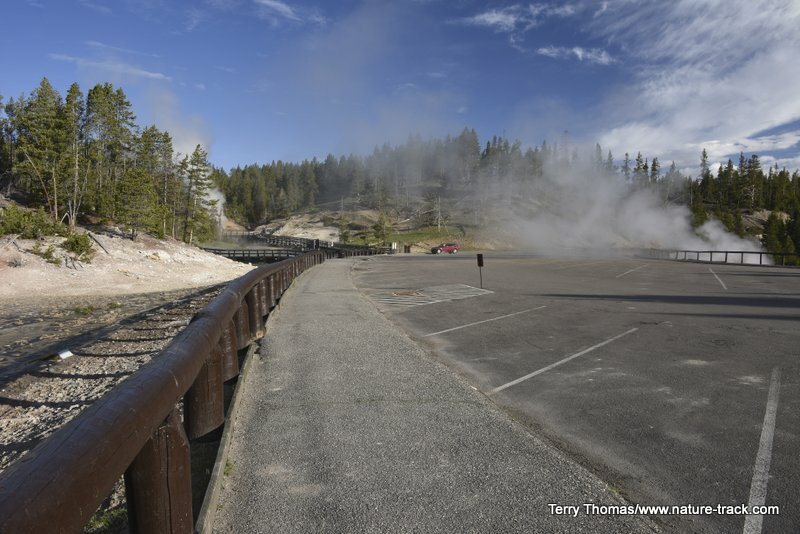 Some of the roads in Yellowstone have been open since April 20. More opened this week and on May 11, you will be able to drive from Old Faithful to Lake and south to Grand Teton National Park. Only the Dunraven Pass Road between Tower and Canyon will remain closed until May 25th. 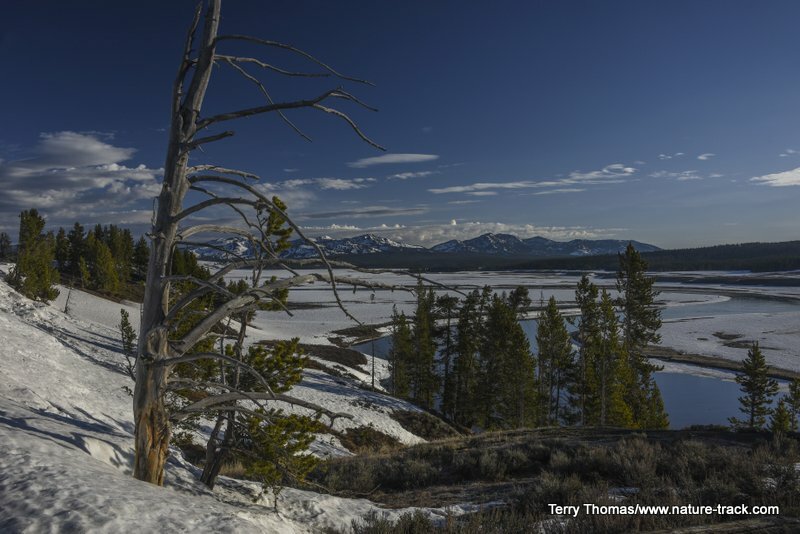 With all that said, what is early spring like in Yellowstone? We spent the night of May 8th in Gardiner to find out. We have been to the Park in the spring many times, but usually closer to Memorial Day. To the best of my recollection, this was the earliest we have ever been there. We entered from West Yellowstone where we found patchy snow cover. The first thing we noticed is that although the main roads are open, most of the side roads are not. Riverside Drive, Firehole Drive, the Old Gardiner Road, Blacktail Road and most others are still gated closed. That was only mildly annoying, but I did realize that had we brought the bicycles, a world of wonderful opportunities would have been opened to us so it is hard to complain. The next thing we found is that the road construction around the Willow Flats area can have long waits. We sat there for about fifteen minutes but we talked with a lady who claimed to be stuck there for two hours. You need to plan for that. We headed to Mammoth and then out to Lamar Valley after securing one of the few rooms left in Gardiner. There was a time when prior to Memorial Day was considered a slow season and rooms were cheap and plentiful. No longer. Spring is becoming popular, although not as popular as summer, and can be surprisingly busy. 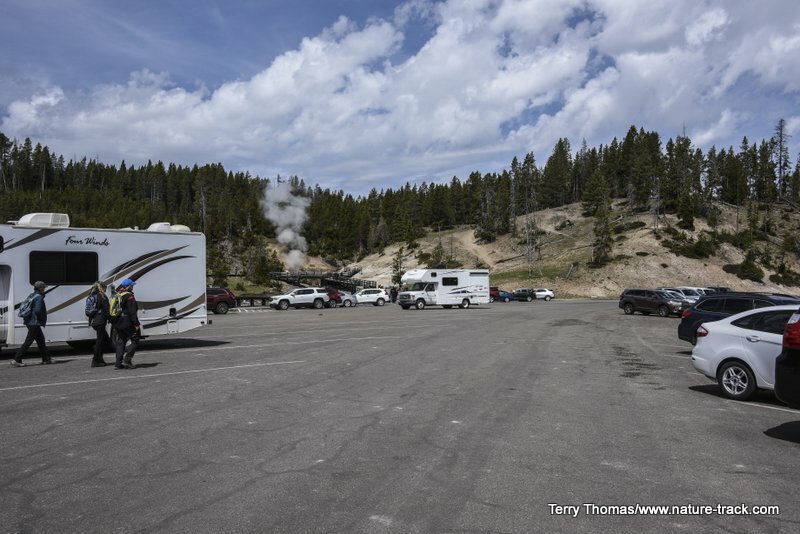 The campground at Mammoth was full last night and Madison Campground looked like it was getting there when we went past about 1500 hours. Lamar Valley had little snow on the valley floor, mostly only where it was piled up by plows in a few places. 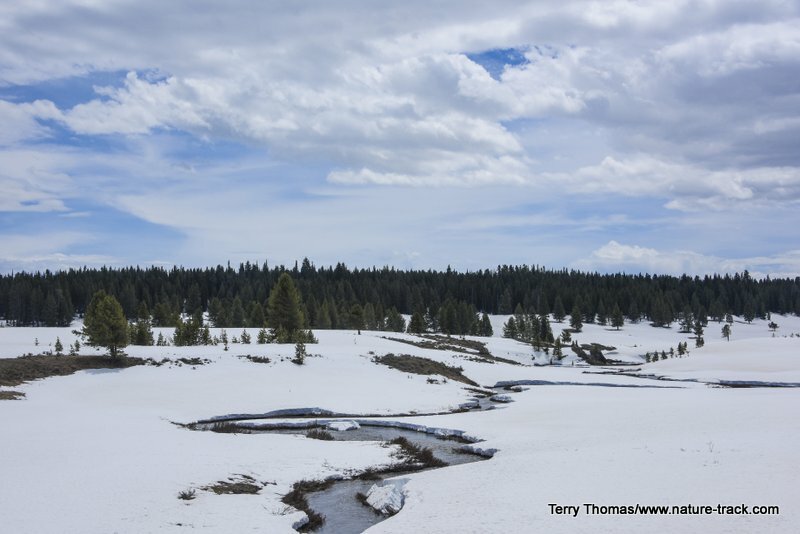 Slough Creek and Pebble Creek campgrounds were closed (both open June 15) and Pebble Creek still had some snow. Above Pebble Creek on the way to Cooke City, the snow depth increased quickly. We did see a lot of bison in Lamar Valley. There were many new “red dog” calves. 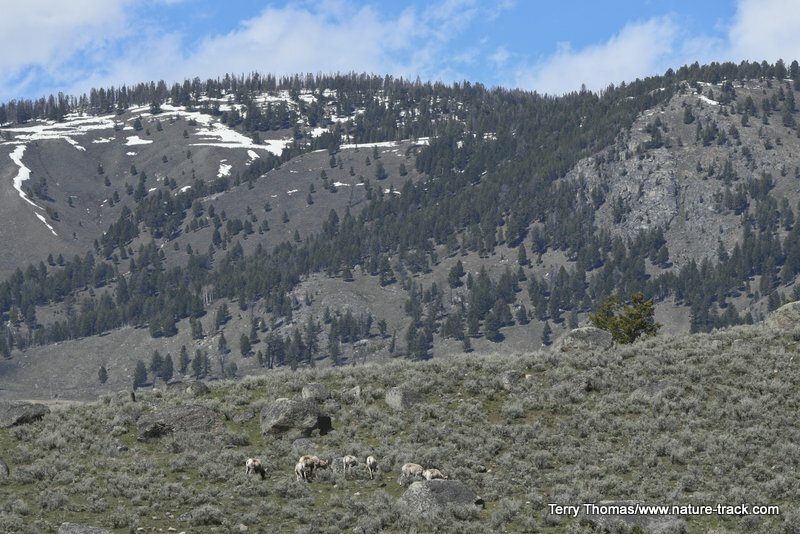 Elk were not nearly so plentiful in the valley but we did see a fair number of pronghorn. 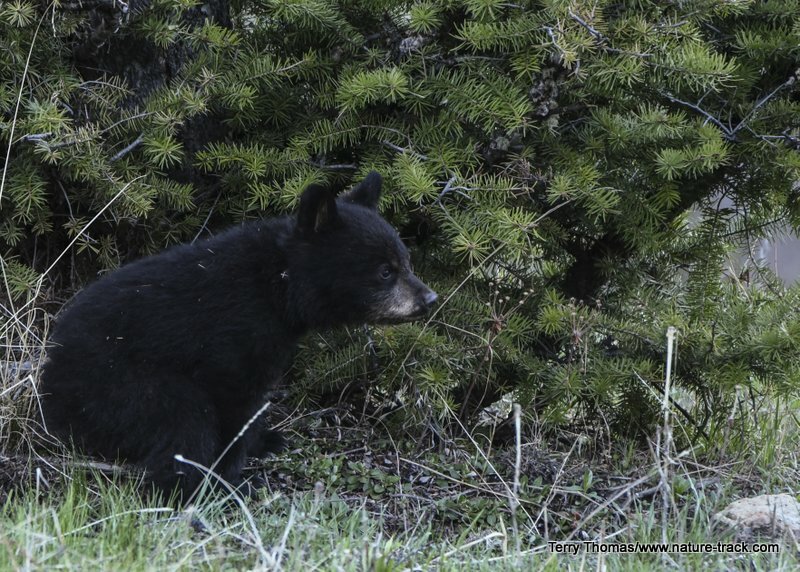 We did not see or hear of any wolves or grizzlies but did find a black bear at the Yellowstone River bridge and a black bear sow and two cubs north of Elk Creek (near the Petrified Tree). Bighorn sheep were the real draw to Lamar Valley though. There were lambs and ewes near the Yellowstone Picnic Area and several groups of rams there and near the Yellowstone Institute. 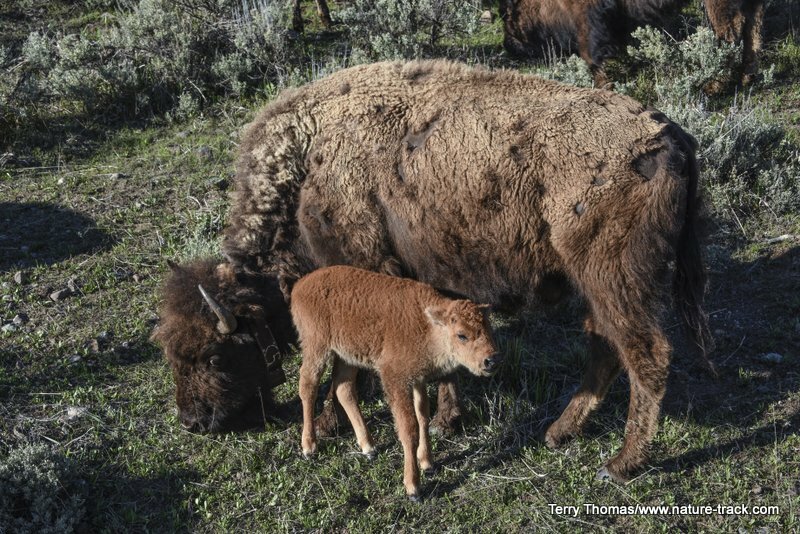 Early spring is the only time you will see "red dog" bison calves. They will change to a more brown color quickly. 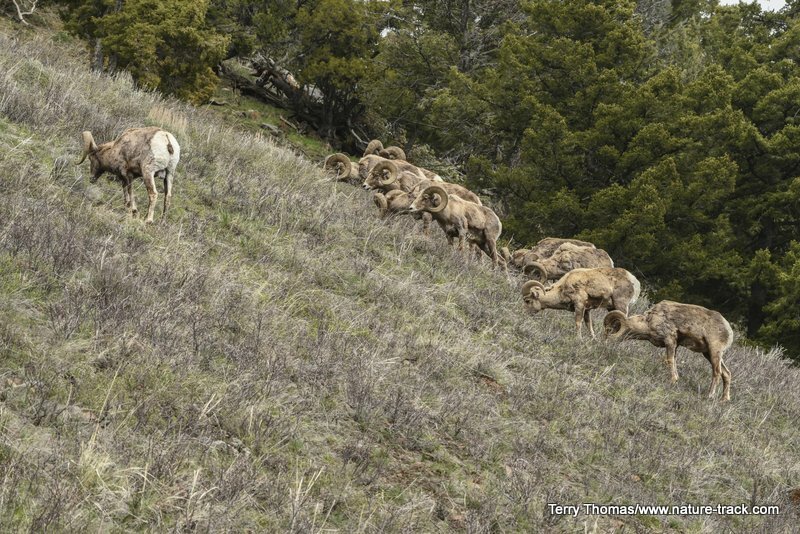 It is pretty cool to see a whole bunch (ten in this case) of large rams that could not care less that you are there. We were on the road by 0530 on May 9th and beat the construction at Willow Flat. We were headed to Hayden Valley and the only way to get there was to turn east at Norris and head to Canyon. The first thing we noticed on this drive was significantly more snow. Most of the area from Norris to Lake is still snow-covered. It was colder on this side too, as low as 28°F. It warmed to the low 60’s by mid afternoon though. From Norris to Canyon and south to the falls, the ground was almost completely snow-covered. Snow-cover in Hayden Valley was receding but still covered much of the ground. We drove part way up toward the east entrance but the snow got pretty deep (the roads were clear—the snow was on the slopes) so we turned around. We drove up the Lake Butte Overlook for some fine views of a still frozen Yellowstone Lake. Two different people told us they had seen a bear there that morning but we didn’t see anything but a porcupine. We also went to Artist Point to see the Lower Falls. No other access point for either the upper or lower falls has cleared trails. Our main purpose in visiting Hayden Valley was to go to LeHardy Rapids to see the harlequin ducks that migrate through there each year. This year though, the area was closed due to high bear activity. Apparently, there is a carcass (bison?) in the area that is drawing in bears. Rumor is that the closure will end soon though. You can still see the ducks from the road but it isn’t quite the same. 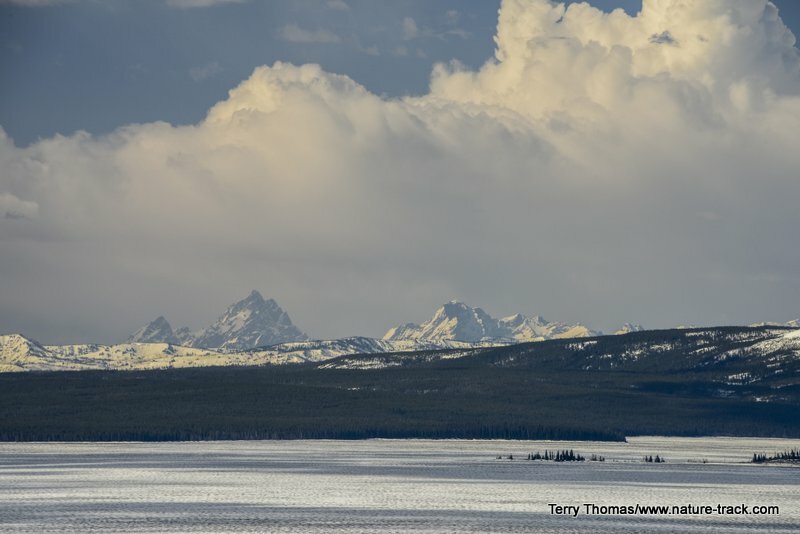 The Grand Teton rises well to the south of the still frozen Yellowstone Lake. On our way out we drove over to Old Faithful. This is one of the first roads to open and was a nice drive but we saw only bison and one bald eagle. There is still snow on the ground in places over there too. In saying that the Park seems crowded these days is, of course, relative. In part is seems more crowded than in past springtimes because all visitors are restricted to fewer areas. However, most of this activity doesn’t get going until about 0930 or 1000. We were in the Mud Volcano parking lot at 0700 and there was one other vehicle. When we ate lunch there about noon, it was almost full. 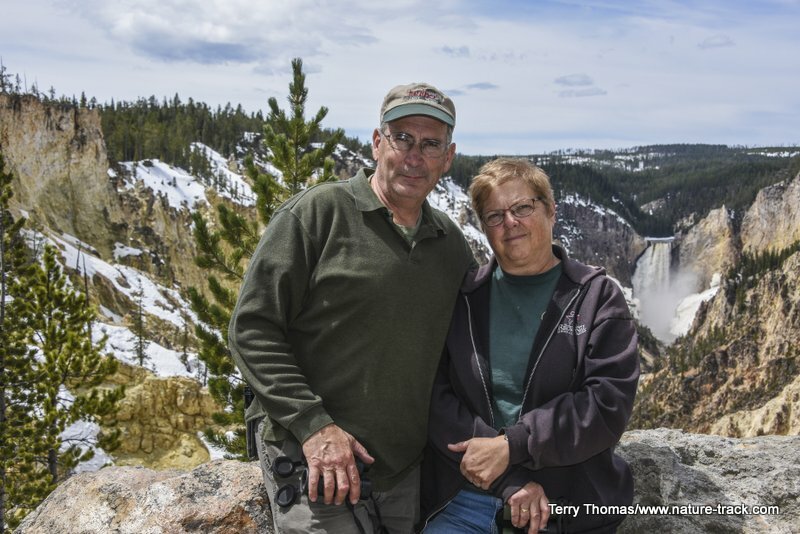 Is Yellowstone NP worth seeing in the spring? Absolutely. There are baby animals, wildlife on the move and as things start to green up, some of the best scenic photography of the year. As an added bonus, fuel costs 20 cents less per gallon in West Yellowstone and Gardiner than in Idaho Falls. I hope to get back there again next week and not just for the “cheap” gas.